One of the main mental hurdles for IT Administrators to overcome when it comes to the cloud is the transfer of control. Admittedly, it’s something that I struggled with early on in my experience with the cloud. I had concerns about how much I could control the environment, its flexibility, and ease of administration. One of the thoughts I always had was that the cloud was essentially a cookie cutter solution that required an organization to fit into the cloud’s design. As I have continued to work with Office 365 and its frequent updates, this seems less and less true. There are many ways to make the cloud fit your organization’s needs as opposed to forcing your organization to meet the cloud’s needs; this blog will demonstrate a couple of ways to do so. Exchange offers many configuration options for each mailbox, but they always start with default settings and values. Some examples of this are the maximum message size, timeframe for recovering deleted items, and the retention policy. The default maximum message size is set for 35 MB. The default retention period for deleted items to be recovered is 14 days. Each user is assigned the Default Retention Policy. If the default values for these settings do not meet a desired standard, they can be reconfigured and customized to meet your organizational needs. The “Set-MailboxPlan Exchange” cmdlet can become a powerful asset for any IT Administrator. Using the cmdlet above, you can change the default maximum message size so that instead of a 36MB message everyone is limited to 20MB or 50MB or 150MB. An option to change the expiration timeframe for recovering deleted items can be set to a maximum of 30 days in Office 365. You can also designate a new retention policy that can be applied to all of your users. Once created, you can use the command below to implement your new policy. There are even options available to adjust the default setting for when a user will receive a Warning message about how much mailbox space is used. Although, if a person is using enough space to fill an Office 365 mailbox we should start talking about email archiving and some other retention options. The last area that I’d like to explore is licensing management. 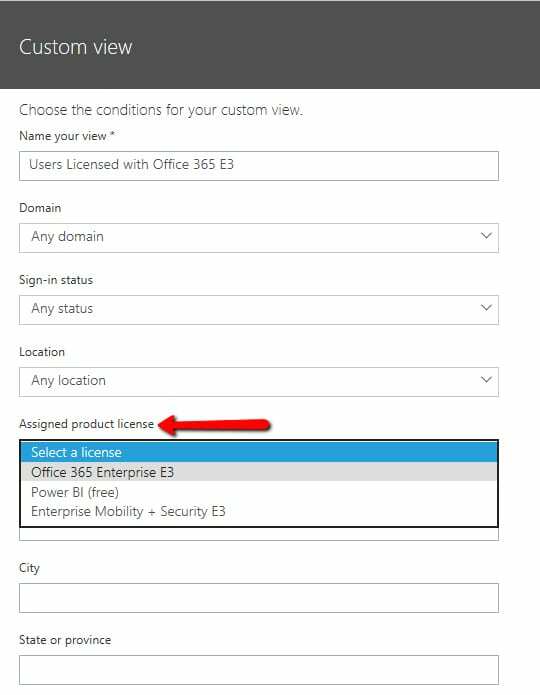 Transitioning to Office 365’s subscription model can be confusing for administrators. Many times it can be difficult to figure out if specific licenses are assigned and which users are assigned the licenses. The Office 365 Admin Console can make simplify this. Within the User section, you can change the Views from All Users to Custom View. This will begin a wizard allowing you to create a custom view to find users very quickly. One of the options within the wizard is Assigned Product License. This makes it simple to evaluate your licensing at-a-glance. There are many commands and tools that can be used within Office 365 to make administration much easier. These extra measures of control should create a daily forecast of sunshine for any administrators that are concerned about giving up control in the cloud. Peters & Associates is always available to help implement these types of efficiencies or provide insight into overall health of an environment. If you need more information or if you’re just looking for help, email info@peters.com.